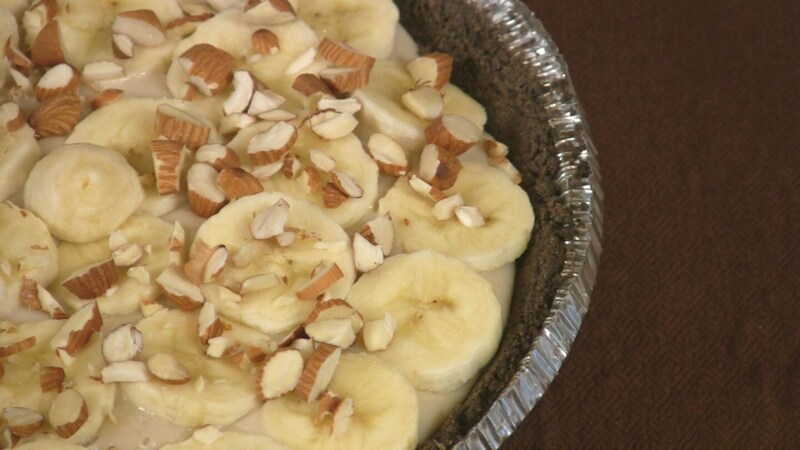 Enjoy this healthy version of banana cream pie. Prepare the crust according to directions and bake. Or, use a store-bought crust. Mix the sugar and cornstarch in a saucepan, then stir in the non-dairy milk. Cook over medium heat, stirring occasionally, until very thick. Remove from the heat. In the meantime, add the drained tofu to the food processor or blender and blend until smooth. Add the cornstarch mixture and blend. Add the vanilla and blend. Slice the bananas into thin rounds and place half of them in the pie crust. Spread the tofu mixture on top. Top with the other half of the sliced bananas. Sprinkle the almonds on top and refrigerate for at least two hours. Watch how to make a whole wheat pie crust from scratch.